Days pass by so quickly, same thing applies to week. As soon as they begin they end especially the weekends ~ there is never enough time to do all things that needs to be done. First quarter of 2014 already gone and month of April soon touching its mid-mark point. Phew! Every time I think and try to manage my time efficiently, I end up wishing for more hours in a day... does that happen to you ? While checking my to do list for the coming week, I suddenly realized its 2nd Monday of the month and I need to post the 4th session in my guest post series. 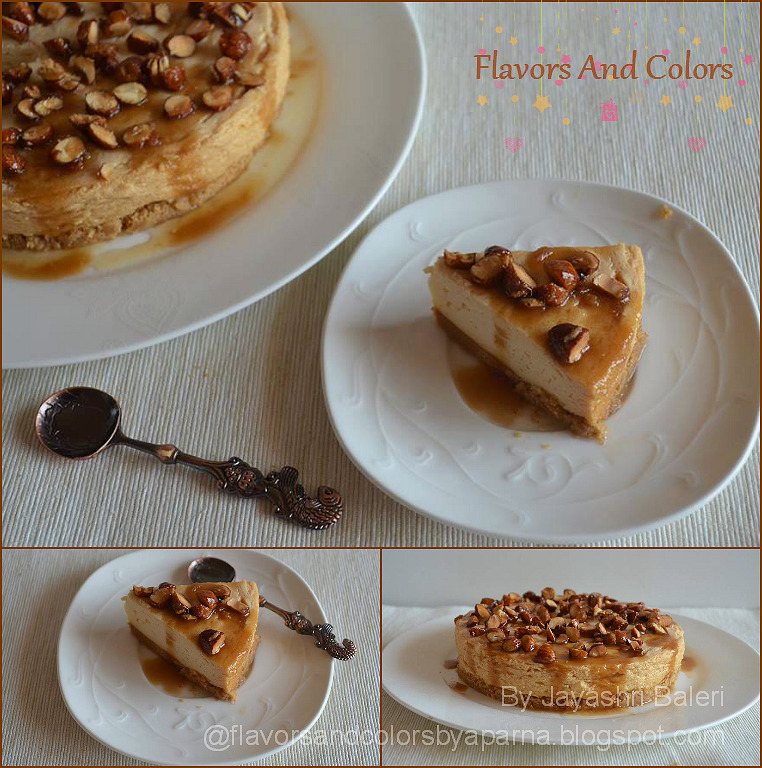 So friends, today I would like to introduce my friend Jayashri Baleri on Flavors and Colors. I met Jay on FB food group. Initial interactions were just related to our recipe posts. Her posts have been inspiring with interesting recipes always and classy presentations that will never fail to tantalize your tastebuds. Many times I have tried her recipes like for Besan Laddoos and Badam Burfis and have been successful with the results. After about 6 mnths time, we became friends, started exchanging messages and in no time our wavelength matched. Now we are close friends as if we have known for years interacting on topics other than recipes. Though our paths crossed on a virtual platform, I am glad to have found a wonderful, loving person like her and hope to meet her in person in near future. Jay is popular on our food group as a dessert queen, who amazes and tempts all of us everytime with her perfect desserts posts! So when I asked her to be my guest she happily agreed. 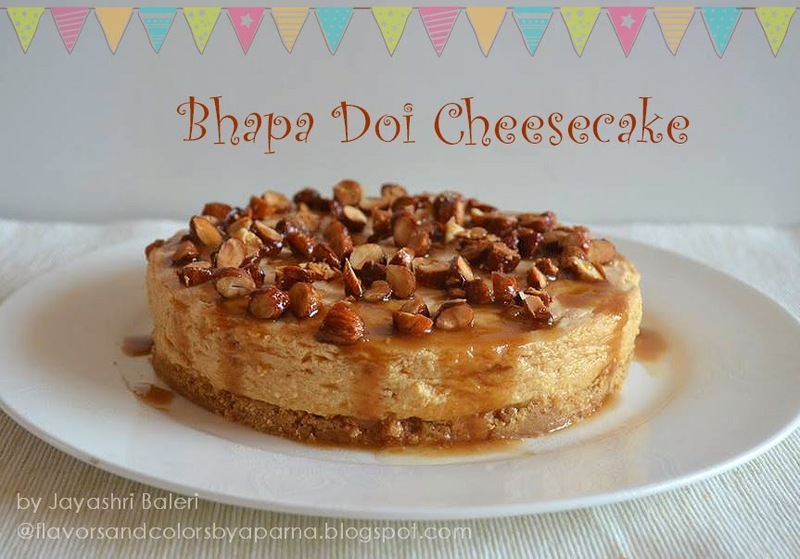 I was super duper excited to see the recipe of Bhapa doi cheesecake being shared by her. I know you want me to stop here as I can imagine your excitement to read through her recipe and drool over those tempting pics. 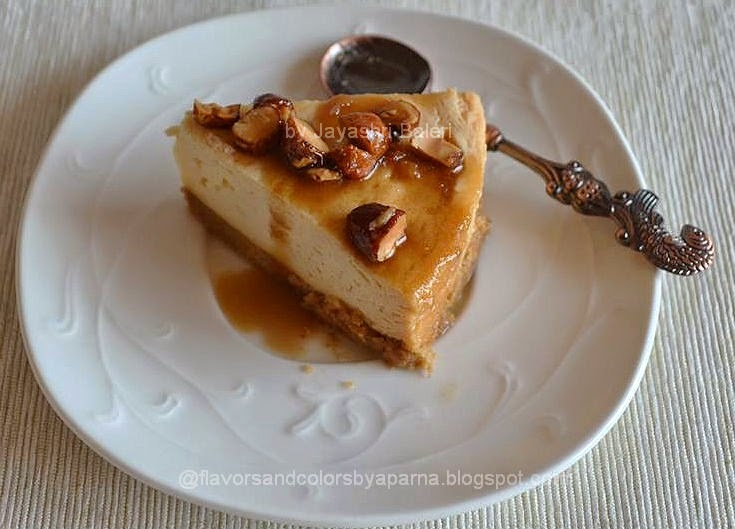 Bhapa doi cheesecake has three components - the base, the steamed bhapa doi which forms the filling and the caramelized almonds which forms the topping. Drizzling it with Nolen Gur [Palm Jaggery] is optional and subject to its availability as well. I found this recipe in the Hawkins cook book which comes when you buy a Hawkins pressure cooker. A keeper of a recipe and there is never a shortage of compliments when you make it for your friends. For the base: Crush the digestive biscuits in a mixer and add the melted butter to it. On your serving plate, spread this biscuit butter mixture in a circular shape keeping the circumference same as that of the bhapa doi mould. Cover it loosely with a cling film and let it sit in the refrigerator when the base sets as the butter hardens. For the Bhapa Doi: Beat together curd, milk and condensed milk till well blended. Pour the mixture into a circular mould/ steel container whose capacity is around 1 litre. Cover the mould tightly with grease proof paper of aluminium foil and tie it securely so as to not allow any water or steam to go into it while it is being steamed. Pour water [about 2 cups], put grid in cooker and place mould on grid. Close cooker and bring to full pressure on high heat [one whistle], reduce heat to low flame and cook for 20 mins. Remove cooker from heat and allow it to cool naturally. Open the pressure cooker, take out the vessel and uncover the mould. Allow to cool to room temperature. Drain off water if any. Refrigerate until you are ready to assemble the cheesecake. For the caramelized almonds: Heat honey, water and oil in a saucepan. When it comes to a simmer, add the crunchy baked almonds and stir till the almonds are well coated. Switch off the flame and add sugar and salt. Mix well. It will get a nice caramelized coating as it cools. This can be made before hand and stored in an airtight container. Makes a delicious snack by itself. Remove the chilled bhapa doi from the fridge. Just pass a sharp knife around the edges of your mould. Drain excess water if any. Place the mould inverted on top of the base that was prepared earlier. Shake gently to release. I have made this twice and both times it has come out absolutely fine. Top with caramelized almonds. If nolen gur is available, just melt a tablespoon of it with a few drops of water in the microwave and drizzle over it for that authentic Bengali touch. Kindly note that Bhapa doi by itself makes a wonderful dessert when served plain or with chopped dried fruits. So if you don't want to take the extra trouble of assembling a cheesecake, you can make the sweet and relish it as it is. Trust me it is sinful pleasure. I must thank my talented, creative, sweet (the adjectives could go on) dear friend, Aparna for having given me this opportunity to share this recipe on her blog. It is truly an honour that she thought of me for this. I always come to this blog when my eyes require visual treats. Keep up the good work dear and I simply love your posts and your photography. I thank Jay for introducing and sharing this 'khub shu-shadu' and healthy cheesecake recipe to my readers here. Inspite of being busy with daughter exams and other commitments you managed to send the recipe with photos in time. 'Tōmākē Dhan'yabāda'. With this sweet, I would like to wish for Bengali New Year. Subho Noboborsho !